With so much work you have put into your custom furniture or upholstery, it would be a shame to not brand or label them in a way that will make it easy for your customers to reach you when they need it. But sometimes is hard to determine which label style is “the right one” for you an your products, and it will depend basically on your style or preference, as well as the type of material it will be attached to, and how easy the process of attaching your label will be. We have compiled some samples of recently made labels made specifically for the upholstery and furniture business, hoping to serve as inspiration or a conversation opener between you and our sales reps. 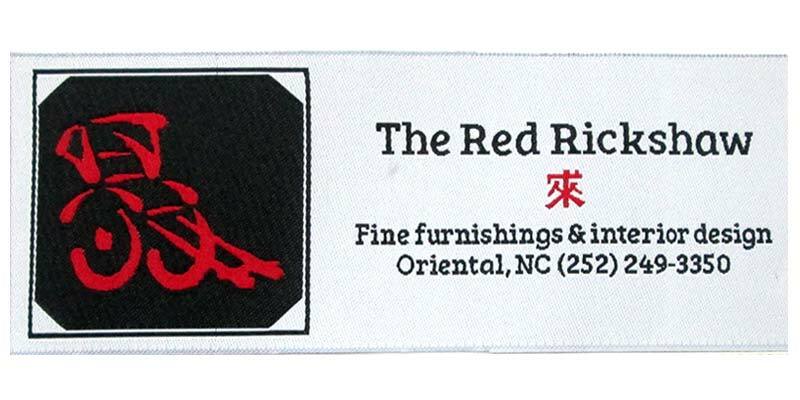 This label is almost a classic in the upholstering business: At 6″ x 4″, it has a size large enough to be noticed by the user, and it contains its logo, company name, tagline, unique selling proposition, place of manufacturing and their website for future contacts. This label was made with woven polyester threads, which will make it very resistant and with bright colors that will not fade easily; its edges have been laser cut, giving it a soft feeling and making it almost impossible to unravel, and it also has an iron-on backing, for easy application and attachment to other fabrics (ironing instructions included). 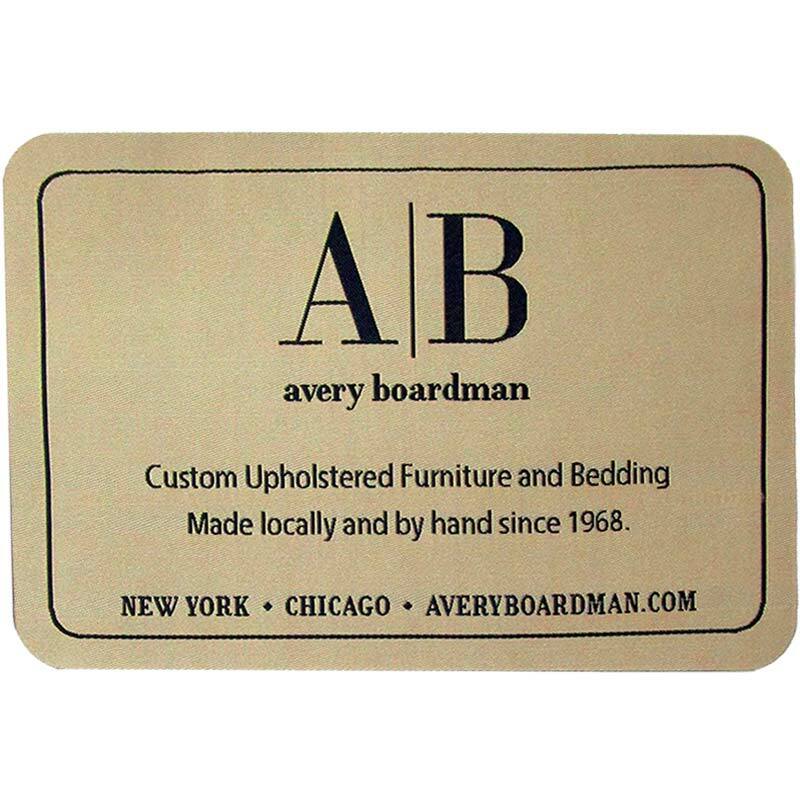 About Avery Boardman: They have the most beautiful samples of their custom upholstered furniture in their website. They have been in business for almost 50 years, starting with their location in New York City. A great label made especially for those products that will be exposed to extreme or rugged environments, as in snow, saltwater and sun, this PVC label is medium in size and its bold design is simple and powerful: logo, company name, contact phone#. Made of Soft PVC material, this label has a ‘special’ sewing channel on the border, which makes it easily attached with a sewing machine. 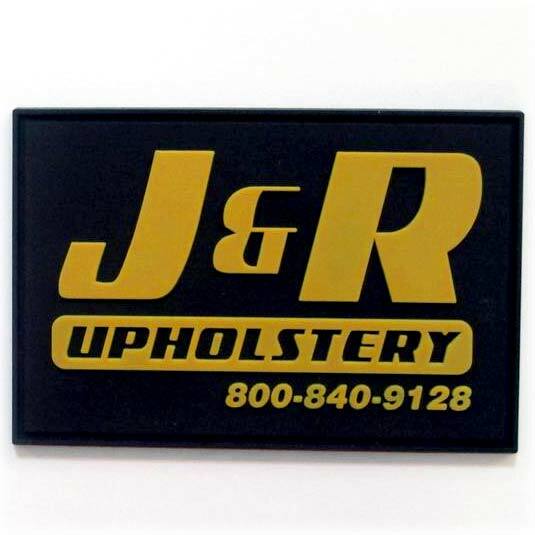 at 3″ x 2″, it works great for truck caps, boat and seat covers and tops, of all those created by our friends at J&R Upholstery, in New York state. Go Big and Bold or go home! This woven label was made in a roomy 3″ x 3″ size, with black & white woven threads, which give it a classic an elegant look. Their logo, company name and place of manufacturing is all that’s in there, with heat-cut borders that will not fray, and an easy-to-apply peel & stick backing, this label will stick easily and stay on the furniture for as long as it lasts. 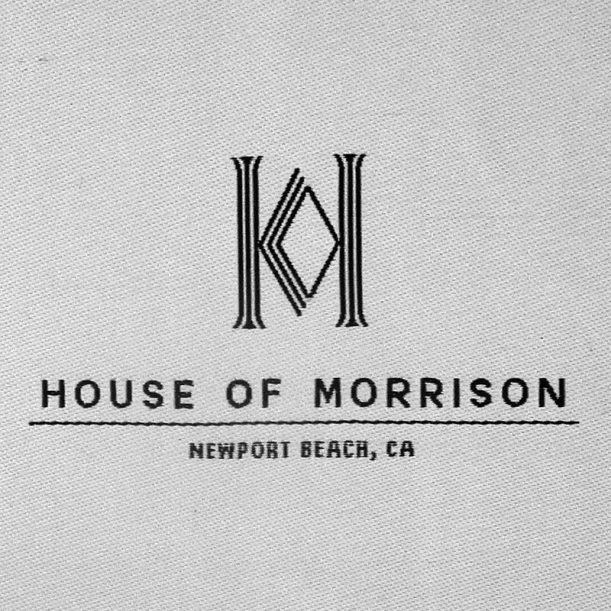 The beauty of woven labels plus the short manufacturing time, were the decisive factors that helped our customer from House of Morrison choose this particular style. Interior designers unite! Our customer wanted labels to adhered under cushions on our upholstered furniture. Colors are red and black on white background. Logo, Company Name, Tagline, Place of Manufacturing and Phone number make this label a great way to cover all of your basis and insure your customers can find you when they need you to. Are you ready to get started with your furniture labels?